Would you like to experience the benefits of a yoga class everyday? This course will show you exactly how! A step by step process that anyone can do anywhere. For those who are relatively new to yoga or have never practiced before. A well balanced sequence for those who have practiced yoga & want to begin a home practice. For those who are very familiar with yoga and feel confident practicing. 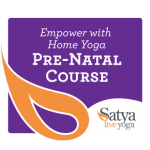 Promoting a deeper connection to yourself and baby during pregnancy. To find out what others are saying about Empower with Home Yoga click here, or see our Empower with Home Yoga FAQ page. Not sure which program to choose? Connect with us.